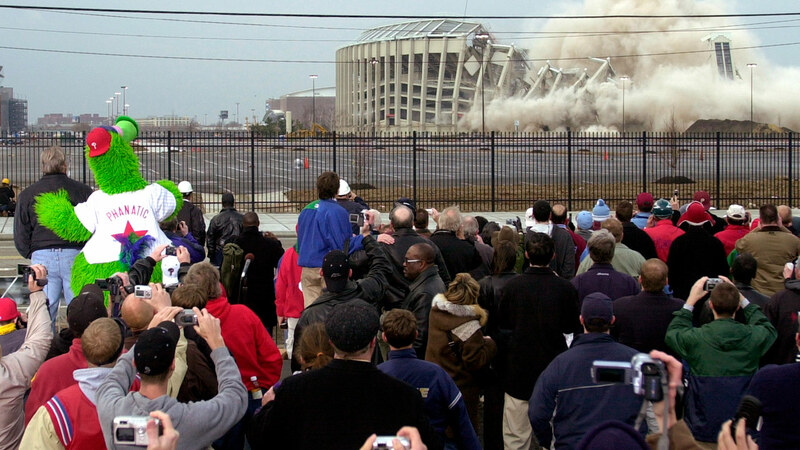 Watch Action News coverage of the implosion of Veterans Stadium from March 21, 2004. PHILADELPHIA (WPVI) -- It's been 15 years since we said goodbye to Veterans Stadium, but we still remember its unique qualities. The Vet was the iconic concrete home of the Philadelphia Phillies and Eagles from the 1970s through the early 2000s. Its characteristics from the AstroTurf to its leveled seating, (who can forget the 700 level), are now stuff of legend. The Eagles' final game was on January 19, 2003. The bittersweet implosion took place on March 21, 2004. The Phillie Phanatic and former Phillies slugger Greg Luzinski joined the many onlookers who packed the Sports Complex in South Philly. They pushed the ceremonial plunger to begin the explosions that morning. Team mascot the Philly Phanatic and former Philadelphia Phillies slugger Greg Luzinski, left, join onlookers as Philadelphia's Veterans Stadium is imploded Sunday, March 21, 2004. Though the Phillies and Eagles moved on, to Citizens Bank Park and Lincoln Financial Field respectively, fans in Philadelphia still hold a special place for the Vet. Even an episode of the ABC hit show 'The Goldbergs' was dedicated to the stadium. Like so many, show creator Adam F. Goldberg has beloved memories of visiting the Vet with his family. "My family grew up attending Phillies games at the old Veterans Stadium. I'm grateful to the Phillies for being part of this episode," Goldberg said.